Screen printing is a fast and affordable way to brand your employee uniforms with your custom logo. Screen printing is a special type of printing technique that uses a screen mesh to transfer ink onto a surface. A blocking stencil is used to cover the negative parts of the printing area where ink is not desired. A blade or squeegee is swiped across the ink-filled mesh to disperse the ink over the printing area. Next, a reverse stroke of the blade or squeegee briefly presses the inked mesh onto the printing surface to create the design. When printing multiple colors, each color will require a separate screen. Colors are layered to create the finished product. Screen printing is ideal for making multiple identical copies of a logo or design. It is very affordable compared to embroidery or other logo creation methods and screen printed designs can be as complicated or as simple as you desire. The cost of screen printing will depend on the number of locations being printed on an item and the number of colors per location. The size of the printed area does not affect the cost of the printing. Nearly any garment can be screen printed. 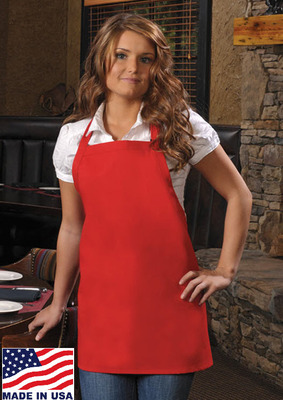 Whether you want to create custom shirts for your mechanics or personalize aprons for your wait staff, screen printing is an affordable way to add a special touch to any garment. Each color used in a design requires a new screen to be made. The cost per screen is $30. In addition to the screen cost, there is a per-item charge for the printing. A minimum order of 24 pieces for screen printing is required per order. Please fill out the below Averill's White Glove Logo Decoration Form, or call 1-877-284-1761 or email Sharper Uniforms to get a written quote for screen printing your garments. When ordering, you will need to supply a digital file of your logo to create the screen print, a PDF is the preferred file type. Minimum is 24 garments for screen printing. How did you hear about Averill's? Why did you select Averill's? Please e-mail Sharper Uniforms or call (1-877-284-1761) us with any Screen Printing or Logo questionsyou may have. 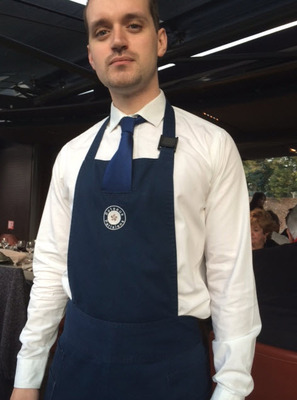 Wear what the French wear with this fabulous Inset Tie Apron with Three Pockets! 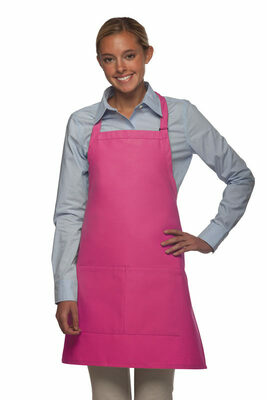 Our Small No Pocket Bib Apron is available in many great colors! It has an adjustable neck loop and measures 24"L X 28"W.